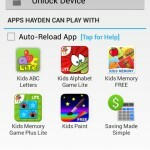 New Parental Lock Protects Phones & Motivates Kids to do Chores! It’s difficult to prevent kids from changing your device’s settings, making phone calls, accessing inappropriate apps and making in-app purchases. Kids need to spend less time on mobile devices and more time with the family/completing their responsibilities. 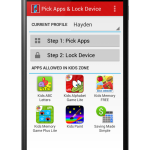 Kids Zone prevents these problems by completely securing your device, only allowing the apps you pick for your child’s profile to be launched. After locking the phone/tablet to these apps, a special “Chore Mode” can also be enabled. Chore Mode motivates kids to do their chores and homework. When enabling Chore Mode parents set a time limit and specify whether to repeat the limit or only have it go off once. 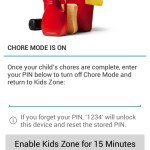 When the time’s up, Chore Mode completely secures the device requiring kids do their chores before Kids Zone resumes. It’s simple, all settings and functions are 1-2 taps away! Please leave a social share if you enjoy the app, super-small developers like me really appreciate it! 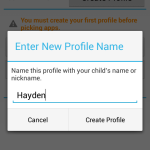 Easily create unlimited profiles for your children with unlimited number of kids apps. 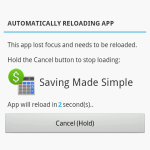 It’s super easy to pick apps using our graphical interface. Home screen of Kids Zone shows the child’s profile apps. Easily loop Chore Mode and change the time limit. 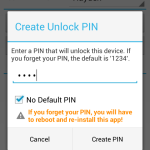 PIN is required to unlock the device, get rid of the default PIN to create a secret PIN for teenagers. This is what the device will look like with the parental lock on. 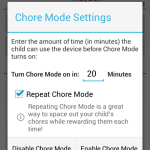 Chore Mode motivates your kids to do their chores by locking the screen. If a child can’t reload their apps, Kids Zone can do it for them, right back to the spot they were at! 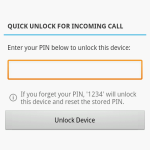 Quickly turn off the parental lock in the case of an incoming call. 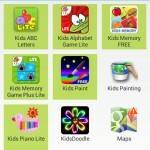 This entry was tagged apps, children, kids, parentalcontrol, parents. Bookmark the permalink. ← AdMob Adds Interstitial Advertising and Brand New Interface! Tablet support is coming soon!